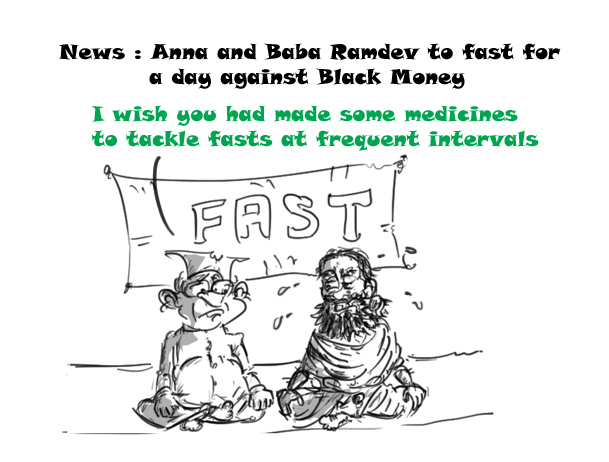 Anna Hazare and Baba Ramdev fasting for a day, tomorrow ! Social Activist Anna Hazare and Yoga guru Baba Ramdev will sit on a day-long fast in Delhi tomorrow to mark their protest against issues of corruption in the nation and black money held abroad by rich Indians. Just a thought- May be, Baba Ramdev’s Patanjali Yogpeeth which does research on Yoga and Ayurveda may have come up with some food supplement for helping people who are fasting 😉 . Thanks for visiting my blog Mydaddysez and for the like. Hope to see you again.